My hands ache, my back is stiff and my body is sore all over — a full three days after swinging a pick-axe, digging up old roots in the yard. But my pain is your gain — at least that’s my hope here today. Sunday was a hard day of landscaping, cutting down and digging up unwanted bushes around our house — most of which are deeply rooted in the hard-baked soil of our 26-year-old home. The previous weekend I strained so hard chopping and digging that I burst a blood vessel in my eye. 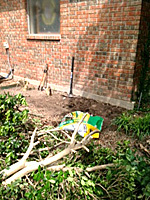 Then I snapped my pick-axe’s wood staff trying to leverage a knotted mass up and out of the earth. 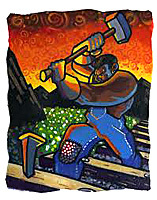 So I bought a new and heavier tool which I was wielding Sunday like John Henry, the legendary railroad worker. Why all the hard labor? 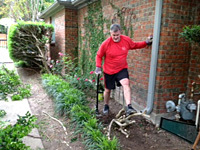 Because my wife Suzi’s garden beautification projects usually require my participation, in this case the removal of ugly, overgrown and prickly bushes that are no longer tolerable as part of our landscaping. Please note that ‘no longer tolerable’ clause, because I’ll come back to that in a moment and relate it to your life and mine. As I shared in last week’s post, working in the garden ministers to my soul and spirit, grounding and inspiring me at the same time. It also promotes thought and reflection, sometimes in the form of parables and analogies, such as the removal of stubborn old root systems from the earth – and from our lives. To put it in personal and spiritual terms, let me pose a few ‘fruit-related’ questions. Do you ever behave or react to things in ways that you later realize aren’t normal or healthy? Do you ever struggle with stubborn thought patterns, worries or fears that just won’t stop harassing you? Do you feel hopeless or doomed to fail in certain areas or activities, as if you’re somehow cursed?Are you sick and tired of some aspect of your life that is keeping you from becoming the person you want to be? If you’re like most people (including me), you answer ‘yes’ to at least one of these questions. This means you have some bad fruit in your life, which brings us to the subject of roots. To change our fruits, we must address our roots. It’s just that simple. Unfortunately, most of us won’t address our roots unless we’re forced to by unrelenting pain or some sort of crisis. But however we get there, we must wake up and decide that the fruit of our lives – like the nasty bushes Suzi and I tolerated for almost ten years outside our home – is no longer tolerable. Like the pregnant young woman I knew who was afraid to become a mother because she knew she was too selfish to be a good one. Or the woman who avoided other women (and downplayed her own femininity) because she knew women would despise her for her beauty. Or the young man who couldn’t control his anger or the other man who was tired of always being in debt. 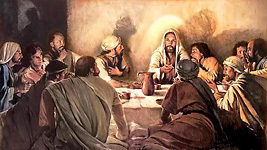 In each case I watched God’s Holy Spirit reveal the root of their condition and help each of them address and remove it as they faced long-buried injuries, twisted beliefs and distorted perceptions in the same moment sensing God’s amazing grace, liberating truth and everlasting love resting upon them. God showed the pregnant woman that her own mother resented giving up her dancing career to become a mother and lashed out at her as a child, repeatedly calling her ‘selfish.’ She was liberated from self-condemnation and fear as she finally ‘saw’ her mother’s condition, forgave her sinful behavior and prayed blessings toward her. With help from the Holy Spirit, the attractive tomboy unearthed her mother’s proclamations to her as a little girl that women would always hate her for her beauty, and her deep-seated belief of that ‘fact’ had driven her away from female fellowship and her best self. She chose to repent for believing a falsehood and forgave her mother for her misguided attempt to ‘protect’ her – and was suddenly free to embrace her beauty and enjoy socializing with other women. The angry young man discovered a string of broken promises and controlling figures from his past and managed to see the damaged condition of those who hurt him and forgive them for their failings, thereby cooling and removing the volcanic fire within him. The chronic debtor discovered his own foolish acceptance of debt as a ‘fact of life’ and repented for tolerating such self-destructive behavior. He took immediate steps to reverse his financial habits. The good news is that removing rotten old roots from our souls is much easier than pick-axing unsightly bushes and roots out of the ground. We don’t have to burst any blood vessels or strain our backs to remove them. 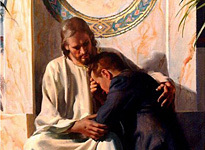 Jesus promised the Holy Spirit would be our ‘comforter’ and ‘counselor’ and would ‘lead us into all truth.’ Scripture reminds us that “where the Spirit of the Lord is, there is liberty,” and “it was for freedom that Christ has set us free.” We need only ask God to reveal the harmful roots within us and help us take whatever steps we can to address them. It will certainly take time (and grace) to address all our roots, but new growth and freedom will come, sure enough, encouraging us to continue the process. 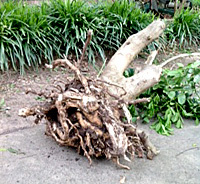 Old root systems connect us to our fallen old nature and stubbornly tie us to generations of painful dysfunction, whereas Spirit-led ministry frees us to live abundant lives of liberty, grace and truth in Christ. Don’t wait for a crisis or let your pain become debilitating. Ask God for revelation. Ask trustworthy friends, family or ministers who know God’s Spirit to pray with you. Allow the Holy Spirit to comfort, counsel and guide you into truth, healing and freedom. Let’s pray. Thank you, Heavenly Father, for reaching and teaching us in simple everyday terms. Help us to dig up the old and twisted roots that hinder our souls, so that we can prosper ourselves and impart truth, healing and freedom to others. In Jesus’ name we pray. Amen! Don’t forget to ‘Like’ or forward this post to others and be sure to share your comments below. Is God revealing a root you need to get rid of? Do you have a testimony to share on this subject? I’m interested in your feedback, as always. Thought I replied before, Ron, guess it hit a snag. I did enjoy your input and was happy to hear our root removal doesn’t have to be perfect and 100% complete to have secondary benefits. More life lessons from the garden! Nice reading J.P. Love that you seem to like this kind of work. I have a wife who loves her garden. She is always tending and planting or replanting. She only needs me for the heavy stuff as well. I have never come to find peace other than when it is done and I am out of there. The fun part is really the enjoyment of being in the finished and grown garden. 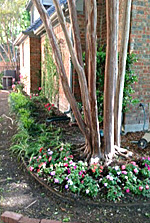 The sights and smells and the life that is drawn to the trees and plants is truly GOD’s handiwork. Breathing in the freedom that is Christ amongst nature is freeing indeed. Yup, gotta love the (finished) sights, scents and sounds (i.e. birds chirping) of a nice garden. Thanks, Jim. Good Post JP! I enjoyed reading it. Thanks, Big Cat! I’ll keep ’em coming, let’s stay in touch! Fly safe!! We were praying for you Friday and hope all went well. Now let’s get some Spring weather dialed up for you guys there in Colorado! (Sunny and 70-degrees here, reminds us of PV! Enjoying it while we can.) Please keep us posted. Much love.